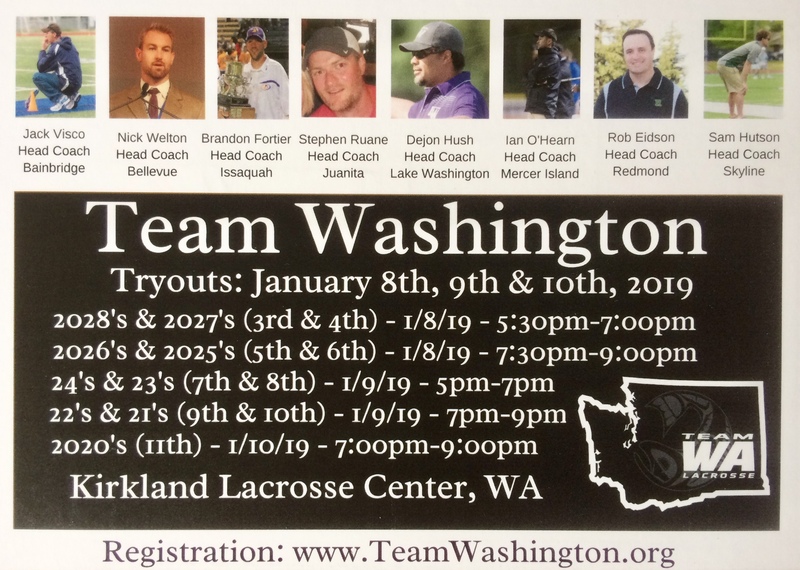 Register now for the 2019 Team Washington tryouts! Team Washington is your son’s best summer travel team option – train with the best coaches, play with the top Washington players, and travel to elite tournaments selected to maximize his exposure to college scouts/recruiters. Register today (https://washingtonlacrosse.sportngin.com/register/form/992454126, and we look forward to seeing your son at the tryouts next month! Players are strongly encouraged to attend their age group tryout on either January 8, 9 or 10—coaches have the best opportunity to review/assess skills when players compete against their peers. All tryouts will be held at Kirkland Lacrosse Center. There will be a brief parent meeting right after the start of each session to cover the basic program information and answer questions. Tryout fee includes a t-shirt and please note that all tryout fees are non-refundable.